The ship Netherby sailed from London for Brisbane on 16 March 1866 with 452 emigrants and 52 crew under the command of Captain Owen Owens. Approaching Bass Strait, overcast conditions prevented the master from taking observations of the sun for several days, and at about 7.30 p.m. on 17 July 1866, the lookout suddenly called “breakers ahead”. Within three minutes the vessel had sailed straight onto the rocks some 35 miles south of Cape Wickham, thus giving her name to a small promontory south of what was later named Currie Harbour. Unlike the ill-fated Cataraqui, 21 years earlier, the Netherby ended up close inshore, and canted over to shoreward, sheltering those on deck from the seas which also appear to have been much more kindly on this occasion. One of the crew managed to get ashore with a line, by which a heavier line was passed to him. One of the boats was hauled to and fro along it to ferry all hands to the beach quite safely. Provisions and gear were then recovered, and tents were made from sails hung from framework cut from small trees in the vicinity. The castaways were provisioned on a pannikin of flour and a packet of cocoa per day. Two days after the wreck one of the female passengers successfully gave birth to twins, bringing the total number of castaways to 506. Chief Officer Parry and eight of the crew set off northwards to find habitation, and five days later met up with superintendent Hickmott of the Cape Wickham light. After they had recovered from their ordeal, Parry and the four strongest men set off for Melbourne in the lighthouse’s boat. Shortly after they sailed, the master turned up at the lighthouse in one of the boats, fearing that his first party had been attacked by aborigines! His fears allayed, he returned to the wreck with Hickmott, who arranged for the 117 single men to walk overland to the lighthouse, each provisioned with two days’ rations. Meanwhile, on the 21st Parry and his four companions had landed near Anglesea on the Victorian coast, having been taken westwards by the currents from their intended landfall at Port Phillip Heads. They wandered around the bush for a while before finding an old shepherd who ran off, fearing they were bushrangers. At length they caught up to him, told him who they were, and he led them to Roadnight’s Station. Here Parry was loaned a horse and rode the 35 miles to Geelong, from where news of the wreck finally reached Melbourne. The Victorian Government immediately provisioned its steamers Victoria and Pharos and sent them to recover the castaways. They were all picked up successfully and housed at the Exhibition Building, while subscriptions were raised to provide them with new clothes and transport to their final destination. However, although they had been bound for Queensland under the Land Order Agreement, many elected to stay in Victoria. In fact, quite a few took up land in north-western Victoria near Lake Hindmarsh to found the township of Netherby. 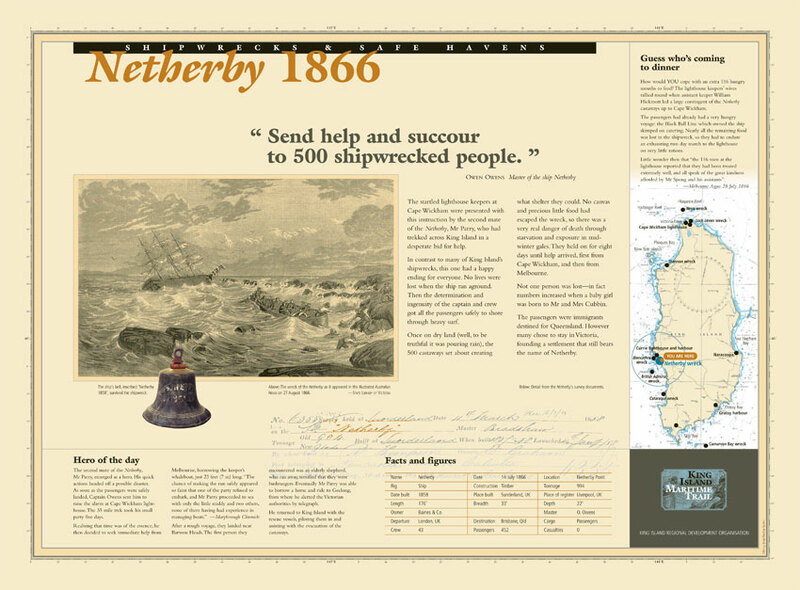 The wreck of the Netherby was sold at Melbourne to a syndicate including Messrs. Currie, and Boyd and J. Donaldson & Co., the ship for 150 pounds and the cargo for 170 pounds. They first dispatched the schooner Lady Don to recover the salvage, but she collided with the pilot schooner at Port Phillip Heads and had to return. The cutter Ben Bolt was then dispatched, and over a considerable period of time much valuable material, including railway locomotive and rolling stock, was recovered. On 21 January 1867 three of the salvage team were either drowned or taken by sharks when a boat sunk after a heavy iron bar fell through its bottom while being hoisted from the wreck. Netherby, O.N. 20,745, was a ship of 944 tons, 176.0 x 33.0 x 22.0ft., built at Sunderland, U.K. in 1858 by Robert Thompson, Jnr., and was registered at Liverpool, U.K. in the name of James Baines & Co., the famous Black Ball Line. REFERENCES; HM 30 July, 7 August, 10 September 1866, 26 February 1867; Reg. Liverpool 97/1860.